Haven't done an Arsenal save for a long time and with the lack of trophies in recent years I decided to undertake the challenge. Here is a brief(ish) mid season 1 update. The transfer dealings went as follows. Jones was initially brought in to rotate at DC with Mertesacker & Koscielny, but I then decided to bring in Balanta, leaving me with 5 DC's (including Chambers). Therefore decided to rotate Jones with Bender as an Anchor Man instead, he has perfect stats for this role, sitting just in front of the back 4 and acting as a 3rd DC when the WB's push forward. With the hefty outlay on incoming transfers I had to balance the books by offloading Podolski (only need 2 strikers) and Cazorla (would have taken playing time away from the likes of Ox & Campbell). Tried to sell Flamini but only received loan offers and looks like Diaby is leaving on a free. My main thing with my current Arsenal save is the competitiveness of the league (not a complaint at all), it's unreal! Have finished 4th, 5th & 4th so far and each season I've been in the title race with City, Chelsea, Man Utd & Everton and it's been nail bitingly close each time.. which is probably why I'm enjoying it so much! 2014/15; I lost the Champions League final to Barcelona. 15/16; won the Carling Cup against Everton (Micky Mouse I know, but still a trophy) 16/17; won The FA Cup against Chelsea. IRL as a Gooner, I think I would be happy with that. Same amount of shots and possession but very one-sided. Another good performance especially as Newcastle were in good form. We conceded our first goals in a while but still produced a good performance. Next round in League Cup is home to Chelsea. Podolski deservedly won player of the month. Ramsey was second Young player was Berahino while I scooped my first manager of the month award. Wacott has returned to full training. He has played 45 minutes for the under 21’s. He’s got another 45 due in a couple of days and then I will start using him in the first team. 4 away matches including the trips to Naples and Moscow. Chelsea cup game is in December. It'll be end of seacond season. They are all under 100k, but some did cost me a large signing on fee! 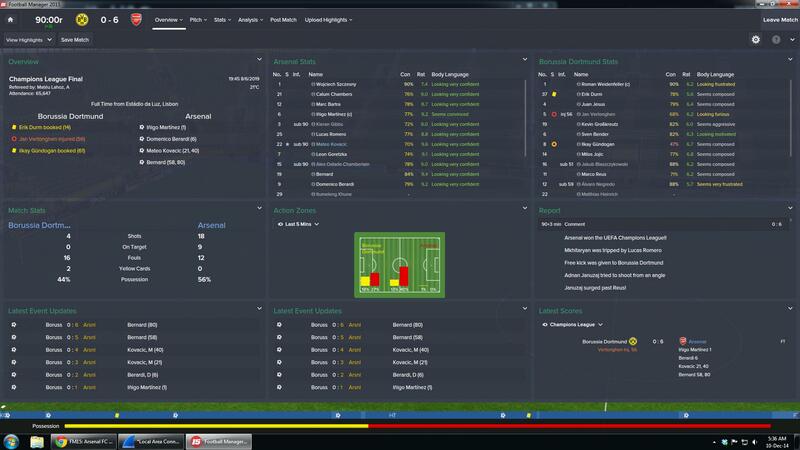 KISS works beautifully with Arsenal in this edition of FM. (Keep It Simple Stupid). New save: 4231 Wide, Control/Attacking, Very Fluid. TI's: Work ball, whip crosses, roam, close down more. PI: Keeper distribute to full backs. That's it. Beginning of April 2015, battling for the title with ManU and Chelsea. Been using Welbeck and Giroud rotating as strikers, and they have 28 and 30 goals respectively, all competitions. IF or W/a - AM/s - IF or W/s. Players in first window: Juan Jesus, Aleksander Dragovic, William Carvalho. Out: Coquelin, Rosicky. In January window: Martin Ødegaard. So as things stand I'm top of the league by one point. Played 13, won 11, drawn one and lost one. The Hull game was a bad day at the office, couldn't create anything and they scored their only half chance. Chelsea are on my tail and don't look like going away any time soon. The only games they've lost this season are to me and Hull(giant killers). The Champions League group stages have been a breeze. Played 5 games, won 3, drawn 2. Already qualified top of the group. Been playing a rotated 11 in this competition to keep my strongest 11 fit for league games. The League Cup knockout to Watford was a shocker. I did have a weakened team out but still expected to win. They dominated me from start to finish. No complaints. League - 3rd after losing to Man utd in the second last game to let them leapfrog me Chelsea won the league with 5 games to spare. Chelsea were beaten 5-4 at Palace meaning a win would send us top of the table. 2-0 inside 5 minutes and then a third 10 minutes later and it was job done. Efficient more than excellent. Walcott having played for England a few days before much to my displeasure marked his long awaited return with a goal. Podolski missed the game with an injury picked up playing for Germany. Back to back 3-1 defeats in the champions league. I played a tighter narrow game but still lost easily. A glimmer of hope when Giroud pulled one back but Tosic finished it off. Still only need a draw at home though to qualify. A first league draw of the season. We looked like heading to another defeat before rallying in the second half. Only Fabianskis heroics stopped us from winning it. United are now 9th after a month which saw them lose all four league games. Giroud won player of the month. Sanchez third. Jon Flanagan won young player with Chamberlain third while I had to settle for second place in manager of the month which went to Brendan Rodgers. A tough month ahead. Next three league matches are City, Chelsea and Liverpool while we also have the Blues in the league cup and host Tottenham on boxing day. In the champions League we just need a point at home to Steaua. Stranger things have happened! So a good month for us. The only loss being to Southampton at a time where I had major injury troubles with me having only 4 available defenders, one of which was Kosielny on 80% fitness. Ended the game with Ox playing at WBL and Gil Romero at CB. The Spurs win was a bit sketchy, probably should have lost based on chances but we were very clinical infront of goal. We've opened up a gap in the league table over Chelsea and now lead by 6 points. In the CL knockout stages we've drawn Napoli, which isn't too bad. Also drawn Bournemouth at home in the 3rd round of the FA Cup so a chance for my youth to make up for the League Cup exit to Watford! In transfer news, I'm still trying to offload Diaby and Arteta. Noticed Nathaniel Clyne keeps rejecting contracts so put in an £8 million and they've asked for £10 million. Considering bringing him in and offloading Debuchy. What do people think? Also, has anyone managed to bring Reus in this early? He hasn't signed a contract yet so I may have a look at that release clause again. I'm in Jan 2016 and Reus has only just signed a new contract, so I don't think there is that much rush. Just reached March of first season and already been given my transfer budget for next season......is it normal to get it that early??? No idea but it's perfect for snapping up regens by the sounds of things! ATB why do you keep deleting your updates? What's the point posting it then deleting? Just grabbed the game. Excited to get started. Think this will be a very active year for me, a lot of travel on the horizon which is perfect for FM on the laptop. Think I will be tackling my first Arsenal save with a 4-4-2 variation. Want to conquer getting Ozil playing well from the wing as my first challenge. 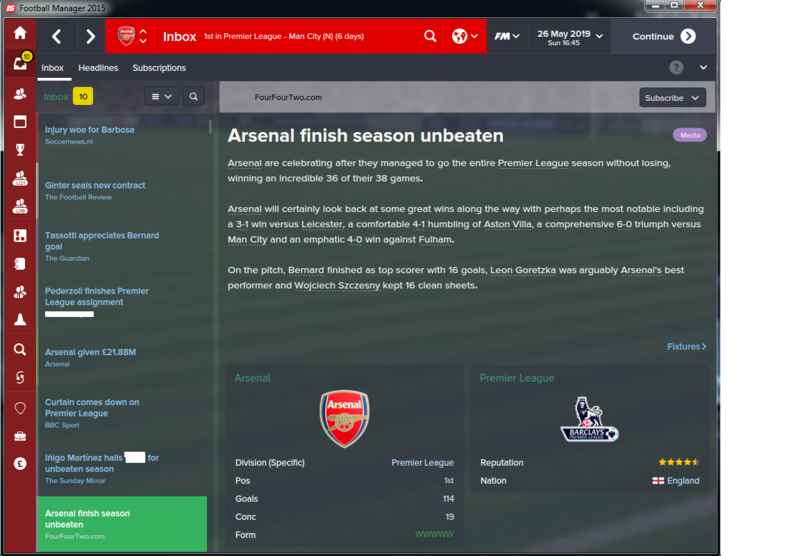 Season one of my Arsenal career is over and has had plenty of highs and lows. The season started with a flurry of transfer activity. The season started well with a 1-0 Victory over Man City in the Community Shield. Unfortunately this was followed not long afterwards with a penalty shoot out defeat to MK Dons in the Capital One Cup 3rd round. In the Champions League, the group stage (Anderlecht, CSKA Moscow & LOSC) was won without too many problems. This came back to haunt us though as we drew Bayern in the 1st KO round (due to them finishing second in their group to Man City). A 0-0 draw in Germany put us in a good position, but a 1-0 defeat back at home meant we lost on aggregate. In the FA Cup we reached the final with a good run, beating some good sides on the way (Crewe 4-0, Man City 3-3 & 1-0, Hull 4-1, Man U 1-1 & 3-0, Southampton 2-1). 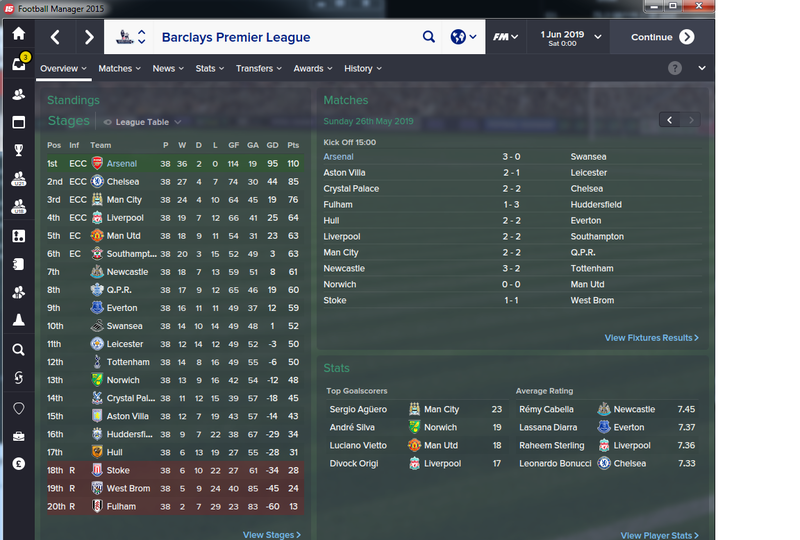 With a final against Championship side Charlton to look forward to it was time to finish the Premier League season. Chelsea were totally unstoppable and won the title with an "Arsenal like" unbeaten season. Despite this, we only finished 12 points adrift with a total of 88 points, which would usually be enough to win the title. The FA Cup final arrived and after going 2-0 down we fought back to take the game to extra time, before going 3-2 ahead, only to see Charlton equalise in the final moments. The penalty shootout was lost in poor fashion, but the stats made a mockery of the final score (typical of this bloody game! ). The squad performed exceptionally well, with Sanchez being the star performer (winning the English Footballer of the Year and finishing as the Premier League Top Scorer). Ox was a pleasant surprise and has leapfrogged Theo in the pecking order at the Right Inside Forward position. The funny thing is that we had more players in the English Players' Premier Division Select XI than Chelsea (Mertesacker, Debuchy, Sanchez & Ozil). I was pleased that every member of the first team squad started a minimum of 15 games, this had been my goal at the start of the season. I have decided not to mess around too much with the squad for next season and to mainly focus on bringing in potential world class youth players. The only change so far has been Monreal out and Lucas Digne in. The only other change is to bring in a good young back-up keeper, maybe Timo Horn, to replace Ospina. EDIT: PSG just declared an interest in Koscielny and asked for a price. He is valued at £13.5m so I said £30m, they countered with £21.5m so I went back with £25m. Surprisingly they agreed so I now need to replace him. Any thoughts? Already got Mertesacker, Balanta and Chambers. Considering Bartra. Spike, John Stones is a good, young British option. If you wanna look abroad you could try Varane, Marquinos, N'Koulou or Aymeric Laporte? I'm on January 2015, first season. Welbo really prolific, he scores 11 goals in league and 4 goals in CL. Meanwhile, Giroud does not perform well. In 12 league apps he's scoreless, even he only managed just 1 goal outside Premier League. Transfer listed him for 16m pounds but seems only Liverpool interested in him, but they don't make offer for him yet. So he might sold for lower amount in 8-12m. Then who to replace him? Sanchez is really good at AMR on Ramdeuter role so i don't fancy move him permanently in striker role. Walcott seems good at upfront but he just recovered and not showing 100 % and just scored 1 goal. Then the other striker Sanogo i loaned him to Wigan. Hey Tinkerer, Highly recommend munir (i think everyone recommends him lol) especially if you use a poacher or false nine role upfront. absolute bargain for that price. Spike, try Samuel Umtiti from Lyon or Alessio Romagnoli for your CB position. Domenico Berardi has been an absolute beast for me up front. I have Carlos Fierro as back-up striker. Giroud has been pretty good for me but if you're looking for a youngster to replace him, I signed Paco Alcacer. He's currently being tutored by Giroud but he looks like he could be a great long term replacement. I have decided to go with Mert & Balanta as my first choice pairing, so want a young DC to pair up with Chambers when I rotate. I have just signed a 17yo regen who will apparently be World Class. He will be ready to replace Mert in a couple of years time. Giroud (& Welbeck in rotation) have been brilliant for me. So much so that I had to fend off interest from Real Madrid in January. Offered 20m for Memphis Depay, now PSV want 59m pounds for him, ridiculous! If you have offered £20m and they want £60m you will get him for £40m. 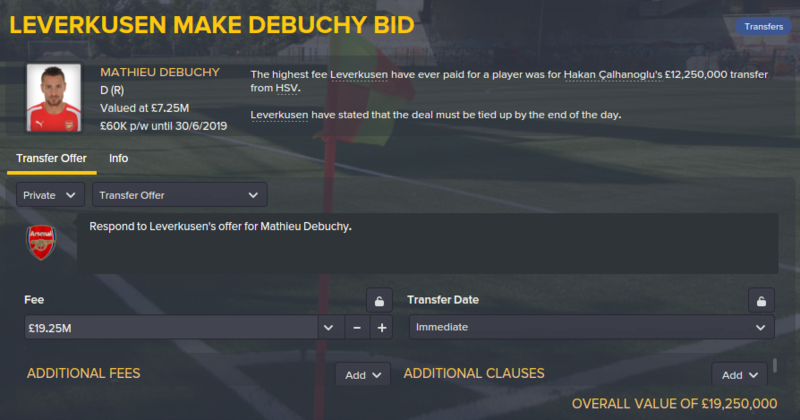 I have noticed that when you make an offer and the other team counter offer, you always end up agreeing a price bang in the middle of the two figures. Just out of interest.. why are you playing Chambers as a CB? Is he not a natural RB on the game? Yeah Giroud and Welbs have both been really good for me. The latter is actually top of the scoring charts in the premier league and I'm now in the middle of Feb. I think if I get some serious interest in Giroud and can get a decent fee for him I'll take it though. As much as I rate him(both in game and real life), I think there are better options on the game for a big club like Arsenal. Phenomenon I've found Chambers more than capable at CB, he will porbably end up there in my save. Yeah I've noticed quite a few people play him there. I guess with me having bought Jones, Balanta and Stones straight away I've not had a need for him to play there. Anyone had problems with Kieran Gibbs? As soon as City showed the slightest interest in him he's asking me for a move. He's second choice to Marcelo so may consider getting rid at the end of the season and bringing in someone like Luke Shaw. Maybe even David Alaba if I get a decent transfer chest. I play him as a central defender. My AML and AMR are scorers of quite a lot of goals for my tactic so I'm not sure he'd be suited to that role for me. How's Depay been for you? Been trying to unsettle him from the start so that he requests a transfer because I refuse to pay the £50 million they're requesting. I have not long agreed to bring in Bakkali in at the end of the season on a free, so not sure whether to keeping pursuing him or just concentrate on turning Bakkali into my long term AML. Hit and miss tbh, he get's stroppy when he;s on the bench, has brilliant soekks for 3 or 4 games where he;s nearly unstoppable, and then has 4 or 5 games where he's pedestrian at best, and when he has one of theses I play Ayew and he's fantastic. So I'm not 100% sure on whether to make him a long term investment or not...the rest of this season will be key for his future I think. On a season update, just been knocked out of the COC 6-at the semi-final point by Utd 6-4 (winning away 3-2 and losing at home 4-1 aet!) Not very happy but hey ho, onwards and upwards. Game got boring though, I'm literally just letting my assistant manager pick team for every match making a few changes here and there to keep players happy. Only reason I don't have a player in the top goalscorers list is because I rotate my players a lot to keep them happy. Have Welbeck, Berardi, Aboubakar rotating as the false 9. My inside forward, Bernard, was my top goalscorer with 16. I was going to sign Denis Suarez, who developed really nicely despite being stuck in Barca B for some reason, but he retired at the ripe old age of 25 after Barcelona released him. He wasn't even injured, just unattached for 1 season. His wage demands put me off initially. Wow, really impressive season for you. Impressive result against Dortmund too. I know what you mean about what to with the game now. Do you have any regens you wanna develop? What tactic are you using? Looking at him, I'd keep him at the club, get him tutored by someone with decent determination.. and just bring him on for the last 20 minutes in games as often as you can afford to. Debuchy is wanted, do I sell him in Jan and risk not been able to bring in another RB and have just Chambers, or do I wait until the end of the season? What season? Have you had a concrete offer yet? I'm just trying to replace him with De Sciglio at the moment.